The young Robin Williams was a manic comic, shooting off bizarre but hilarious improvisations like a Fourth of July sparkler. He wrote and performed for The Richard Pryor Show, a brilliant but censor-saddled sketch comedy show that lasted just four episodes in 1977 before NBC pulled the plug. In 1978 Williams made a guest appearance on Happy Days, playing the space alien Mork from Ork. This quickly led to his own sitcom, Mork & Mindy, co-starring Pam Dawber. His first big-screen role was the perplexing Popeye, with Robert Altman directing a screenplay by Jules Feiffer, music and lyrics by Harry Nilsson, Shelley Duvall perfect as Olive Oyl and Williams giving a spot-on rendition of the spinach-eatin' sailor's hug-gug-gug. In his second film, Williams played T. S. Garp in an enjoyable albeit saccharin and sentimental adaptation of John Irving's The World According to Garp, and he has been a major star ever since. His better films include Moscow on the Hudson, Good Morning, Vietnam, Dead Poets Society, Awakenings, The Fisher King, Aladdin, Mrs. Doubtfire, and, if you have a high tolerance for schmaltz, Patch Adams. As Williams' youth faded and his fans grew older, the audience for his wacky comedy ebbed. The same schtick that seemed cute and mischievous in his mid-20s, à la Mork & Mindy, could seem a little sad when performed by someone in his 40s or 50s (see Flubber). 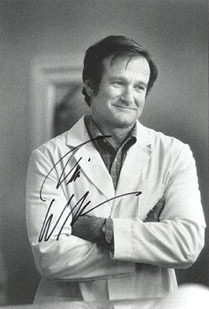 So Williams tiptoed away from comedic films, and reinvented himself as a 'serious' actor, headlining somewhat overwrought melodramas like One Hour Photo and Insomnia. He won an Oscar as Matt Damon's psychologist in Good Will Hunting. Williams was reportedly one of the last people to see John Belushi alive, as they snorted cocaine together. An '80s live-in girlfriend of Williams, cocktail waitress Michelle Tish Carter, sued Williams in 1986, claiming she had contracted herpes from him. She demanded $6.2 million, and the suit was settled in 1992 when Williams forked over an undisclosed amount. Williams was a good friend of Christopher Reeve, but there's no truth to the talk that Williams picked up the tab for years of Reeve's medical expenses. Williams continued performing stand-up, often headlining "Comic Relief" events for charity, and donating his services for liberal fundraising events. He was an outspoken critic of President George W. Bush. "The W stands for 'where the hell is it?' You know, you look at George W. and you realize some men are born great, some achieve greatness, and some get it as a graduation gift. So sad. I just want to ask the Secret Service, is it true that his Secret Service code name is Gilligan?" Reportedly deep in depression, he took his own life in 2014. His widow later revealed that Williams was in the early stages of Parkinson's disease. Sources vary, 1951 or 1952.